Generating interest in your business and driving traffic to your Website is, of course, the first and probably most important step in your online marketing strategy. However, it’s also important to ensure people remember you whenever they need products or services like yours in the future. This is one of the most vital aspects to branding your company. You don’t want your satisfied customers or clients to forget about you and choose one of your competitors, which is why it’s necessary that you stay in touch with your current and potential clients. Although there are a number of different ways you can accomplish this goal, the effectiveness of email newsletters, announcements and the like cannot be overestimated. These simple tools are a great way to stay in contact with your audience and keep your business fresh in their mind. However, you also have to ensure that you don’t overdo it by flooding their inboxes with useless emails that will cause people to unsubscribe from your newsletter, or worse, get marked as spam. It’s important that your email marketing doesn’t push anything onto people that they don’t want. Your goal should be to provide useful information on current specials or deals you’re offering, new services or simply just to keep them up to date with the latest news and developments. If done properly, email campaigns can be an important part of your online marketing strategy and offer one of the best returns on your investment. Although some would have you believe email marketing is outdated, the numbers show something completely different—especially considering how easy it is to put business emails and newsletters to use. Having well written email copy can not only provide valuable information to your audience, but it also provides a more personal form of communication and targets an already captive audience—people who were compelled to sign up for your newsletter or email communications in the first place. With uluad’s Stay in Touch Program, we take the burden of creating effective marketing campaigns off of you and put it in the hands of our professional team who know how to write engaging copy that really works. After all, getting people to sign up for your newsletter is only half the battle. It’s of no use if people quickly unsubscribe or block you from sending them future correspondence. And even if people are interested in receiving emails from you, there’s a good chance your emails will be blocked by their spam filter if they’re not written properly. In fact, it is estimated that as much as 20% of permission-based emails (emails people have signed up to receive) are blocked by their email provider’s spam filters. uluad takes all the necessary steps to prevent this; we take the time to understand fully what is considered spam and what isn’t. Our team is highly knowledgeable about how spam filters and email firewalls work, and we know what words to avoid to ensure you newsletters and other emails reach their intended audience. With years of experience in successfully running many different email campaigns, we also know what type of information people want to receive—including what people expect from newsletters and the types of daily specials and deals that spark interest. In short, our email marketing services are top of the line. 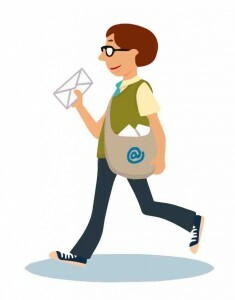 So if you choose us to run your newsletter and email campaign, we will make sure what we send out is actually of value. What we won’t do is send out emails to people who either haven’t subscribed or who have indicated they no longer want to receive them. In fact, we follow the CAN-SPAM Act to the letter and we would never risk your name or reputation by sending out unwanted or unsolicited emails. Of course, an important part of email marketing is getting people to sign up for your newsletters in the first place. As a leader in all aspects of online marketing, uluad will not only successfully run your email marketing, but we can also use other strategies such as social media marketing to increase your subscription list and generate interest in your company. After all, what’s the point of having great email marketing copy if no one actually reads it? We can make email marketing work for you. Contact us today to find out more about our Stay in Touch Program and see how uluad can help market your company.